﻿ Can I add bookmark for office to 3D page flip book? Q:Can I add bookmark for office to 3D page flip book? I used 3D PageFlip Office to convert a word file into a 3D page flip book. However, there are too many pages in the word file and the 3D page turning are the same. How can I quickly find the targeted flipping page? Here will be bookmark to assistant readers quickly find the targeted page. Users should design bookmark first before converting office file to 3D page turning book. Step1: Click “Bookmark” button in the tool bar. 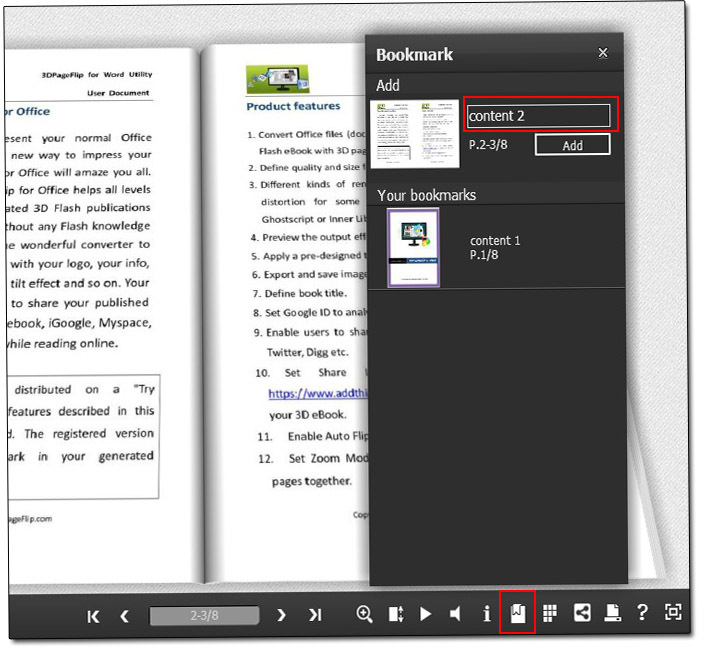 Step2: Flip your 3D eBook to the page that you want to set book mark. For example, flip the book to Page 2, and then enter its title (content 2) in the related form in the book mark interface. Step3: Press “Add” to apply change.